Strawberry-rhubarb is a combo for the ages. One of the best things about spring is that it's both rhubarb and strawberry season. Which means you get to experience one of the greatest food combos in as many baked goods as you want. 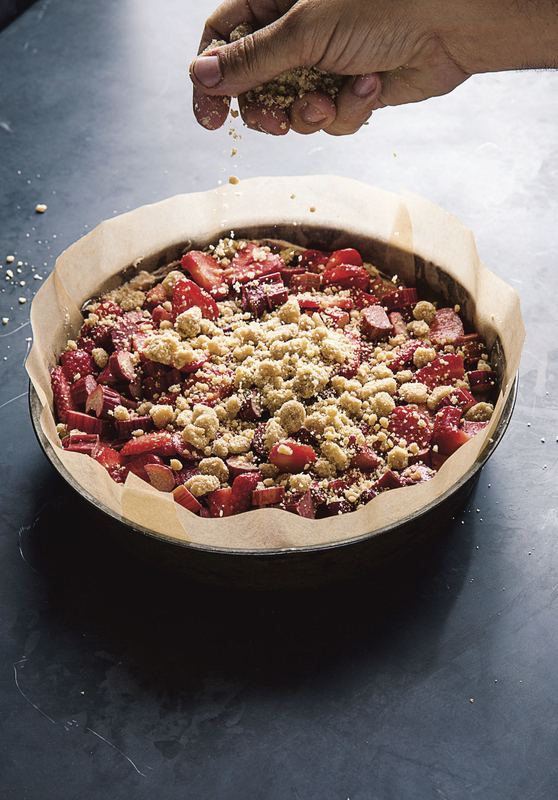 And one of the best ways to enjoy those flavors is this rhubarb and strawberry crumble cake. It's from Yotam Ottolenghi and Henlen Goh's cookbook Sweet. Ottolenghi is a Middle-Eastern food wizard and the bestselling author of cookbooks like Plenty and Jerusalem. Helen Goh is a pastry chef and Ottolenghi's longtime collaborator. This crumble has it all: a fantastic cake base, a delicious strawberry rhubarb layer, and a thick crumb topping. Here's the recipe if you want to make it at home! Preheat the oven to 375°F/190°C. Lightly grease a 9-inch/23-cm round or square springform pan (or deep cake pan with a removable base) and line with parchment paper, then set aside. To make the crumble, place all the crumble ingredients in a large bowl and use your hands or a wooden spoon to mix; you need to work the mixture quite a lot to get evenly moist, large crumbs. The consistency will be damper and more pebbly than you might be expecting, but this is what you want. Set aside. To make the fruit, place all the fruit ingredients in a medium bowl, toss gently to combine and then set aside. even out the surface. Next, spoon over the fruit mixture and then sprinkle evenly with the crumble mixture. Bake for about 70 minutes, until the cake is golden brown on top and a skewer inserted into the center comes out moist from the fruit but with no trace of wet batter. Have a look at the cake after 25 minutes; if it looks like it is getting too dark on top, cover the pan with aluminum foil for the remainder of the baking, to prevent it taking on any more color. Set the cake aside until completely cool before removing from the pan and transferring to a cake platter to serve. We make this in a 9-inch/23-cm round springform pan, but use a 9-inch/23-cm square springform pan if that is what you have. Either way, just make sure it is springform or a deep cake pan with a removable base. Once assembled, the cake will keep for 2 days, covered in plastic wrap or stored in an airtight container. The fruits may discolor a little, but this won’t affect the taste. Reprinted with permission from Sweet: Desserts from London's Ottolenghi by Yotam Ottolenghi and Helen Goh, copyright © 2017. Published by Ten Speed Press, an imprint of Penguin Random House. 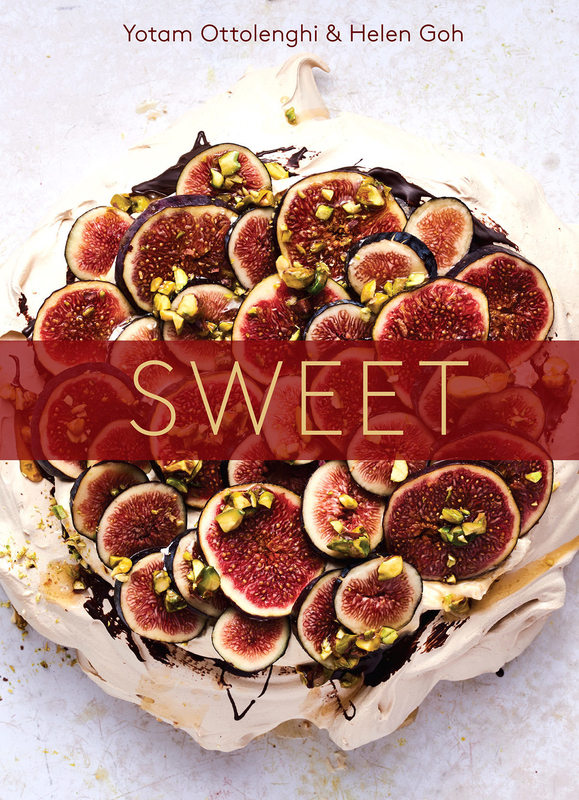 For more delicious recipes, check out Sweet: Desserts from London's Ottolenghi by Yotam Ottolenghi and Helen Goh, which you can order here. Get it from Amazon for $18.99+, Barnes & Noble for $18.99+, or a local bookseller through IndieBound. Check out these recipes we loved this month for more dessert inspiration.